Sgt. Zbigniew Mroczkowski, Aviation Task Force, attaches the cable of a lift basket to a UH-60A Blackhawk during the Hurricane Readiness Exercise at Atlantic City International Airport. From Guantanamo to the Sinai, from Iraq to Afghanistan and from New Orleans to the Southwest Border, the New Jersey National Guard has been a presence around the world during the last few years. However, recent flooding in the Delaware Valley area has brought home the fact that the Guard is just as important when performing its state mission, which is ensuring the safety of New Jersey citizens. On May 20, members of the NJNG Aviation Task Force participated in a state-run emergency rescue exercise that included federal, state and private sector aviation personnel. The event, which took place at the Atlantic City International Airport's Emergency Operations Center, was coordinated by the State Exercise Support Team, part of the New Jersey Office of Homeland Security and Preparedness, and involved helicopters from the New Jersey National Guard, the New Jersey State Police, the U.S. Coast Guard and civilian agencies. 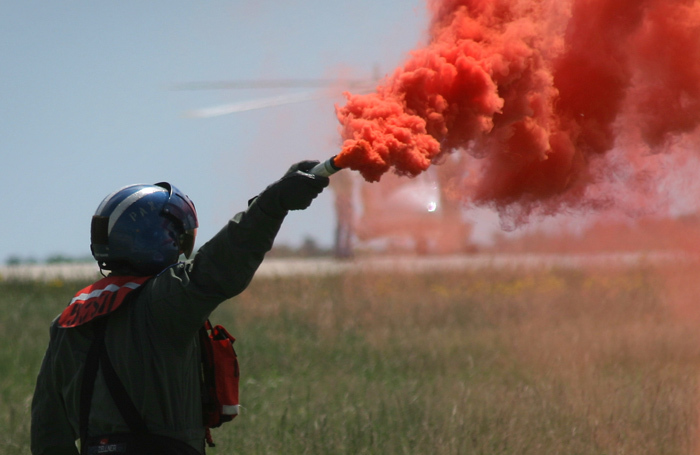 A United States Coast Guard crewmember alerts helicopters to the location of a victim during the exercise. The simulated exercise scenario assumed that a hurricane had struck Cape May County, where a number of civilians had refused to heed warnings to evacuate their homes. The helicopters were used to transport medical personnel and to rescue victims from the disaster scene. In addition, a communications system designed to coordinate radio traffic between the participants was tested. 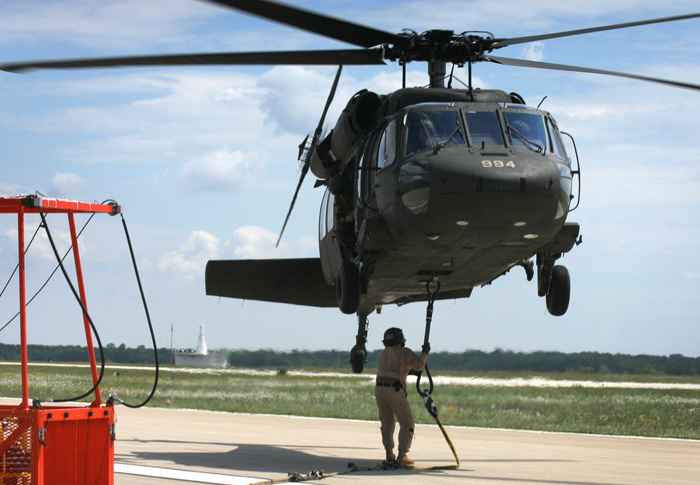 The Guard provided one UH-60 Blackhawk and two OH- 58 Kiowa helicopters for the exercise. The four-seat Kiowas were used to ferry emergency personnel to simulated disaster scenes, while the larger Blackhawk moved large payloads of equipment or personnel as the mission dictated. "New Jersey's security and preparedness depend on partnerships that unite the public and private sectors, and all levels of government," said Homeland Security and Preparedness Director Richard L. Cañas. "With this exercise we are testing and enhancing our ability to work together during a real emergency." Col. Jorge Martinez, NJNG State Aviation Officer, echoed those thoughts. "This exercise is another step in the ongoing cooperation between the State Police, State Office of Emergency Management and the New Jersey National Guard to better support the Governor and protect our state and nation during times of emergency." On Aug. 7, the Department of Military and Veterans Affairs leadership held a follow-up meeting with the federal leadership to discuss further coordination in the event of a natural or man-made disaster.